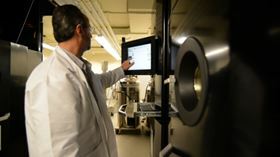 Pratt & Whitney design engineer Louis Porretti uses an electron beam melting machine that is part of the new Pratt & Whitney Additive Manufacturing Innovation Center at the University. Photo courtesy University of Connecticut. The centre currently has two Arcam electron beam melting (EBM) A2X model machines for the manufacturing of large, complex metal parts at high temperatures. The A2X models are the first to be introduced in North America, and the two EBM machines are believed to be the first of their kind in the Northeast. The machines uses advanced powder bed manufacturing technologies and high-powered electron beams and lasers to repeatedly melt fine layers of powdered metals, such as titanium, into one solid integrated piece. This layer-by-layer process allows for the creation of complex, three-dimensional objects without the constraints of the traditional manufacturing process. Additive manufacturing can reduce production time from design to prototyping to finished product, and results in components with material properties better than cast. It also reduces the amount of raw material used and the need for tooling as parts can be made on-demand and on-site. The Pratt & Whitney Additive Manufacturing Innovation Centre will be used to further additive manufacturing research and development and is the first additive manufacturing facility in the Northeast to work with metals rather than plastics, according to the university. Pratt & Whitney engineers and UConn faculty and students will use the centre to develop advanced fabrication techniques for complex production parts that are in high demand in aerospace, biomedical science, and other industries. They hope to elevate Connecticut industries' production capabilities, reduce manufacturing times, eliminate material waste and allow for the creation of a new generation of intricate, lightweight, and durable custom products. The centre also will be used to train a new generation of engineers and designers in the latest advancements in manufacturing technology. "Additive manufacturing is complementary to traditional methods by enabling new innovation in design, speed and affordability, and is necessary to build the next generation of jet engines,” said Paul Adams, Pratt & Whitney's COO. Pratt & Whitney is currently using additive manufacturing to build complex components with for the PurePower commercial jet engine. Pratt & Whitney invested more than US$4.5 million in the centre and over the next five years will invest an additional US$3.5 million in the facility.